Looking for last minute Eid Gift Ideas for your loved ones? Well, we have an offer that you simply won’t be able to resist! 😉 Eid Al Adha is one of the most important Muslim holidays and everyone goes out of their way to make sure they buy and deliver the best in the clothes they wear, the places they visit or the gifts they choose! Eid time is a celebratory time and it calls for enjoying life’s splendors in all its good and positive ways. 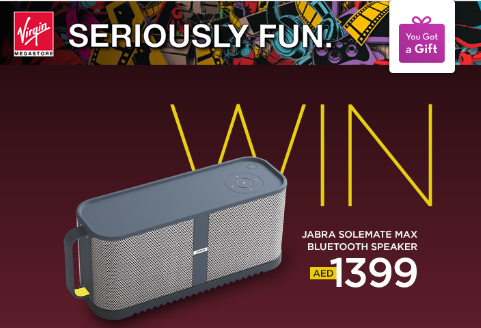 This Eid, surprise your loved ones by buying a Virgin Megastore eGift Card and get a chance to WIN *drum roll* the latest JABRA Wireless Speaker worth AED 1,399!! Exciting isn’t it? The offer is valid for UAE residents only until 7th October 2014. Virgin Megastore carries everything from books, games, movies, concert tickets, and the hottest electronics on the market. 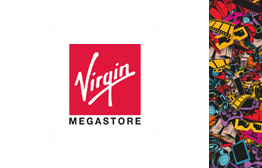 Give your friend a treat with one of our Virgin Megastore eGift Cards! From MacBooks to iPads, tech lovers are bound to find just the right gift. They also carry a wide variety of the latest games and consoles, such as the Nintendo Wii, PlayStation 4 or latest X Box. If gadgets aren’t your thing, they have a great selection of book titles by known and upcoming authors in business, literature, non-fiction, art, health, children and more. For all the movie buffs, they can select from numerous video categories including, drama, comedy, romance, horror and more. Perhaps you want to gift the latest music albums by popular artists? Virgin Megastore has an extensive roster of music to choose from in all genres such as pop, rock, R&B, dance, jazz, blues, children and more. For the music enthusiasts, they can also purchase concert tickets for the hottest shows in town! However, if you are looking to gift something a little different, Virgin Megastore also offers neat and quirky products in their ‘REDBOX’ section such as neat stationary, home décor items, toys, licensed fashion and cosmetics that are ideal for many occasions. Virgin Megastore provides “an innovative entertainment destination for the young and young at heart,” with their distinctive shopping experience. It’s the ultimate eGift Card for anyone who loves to be entertained.